Make a Donation to Manos Magazine! Support Manos Magazine with your tax-deductible donation today. Your donations will help support our ability to take on challenges and push ahead on all of our important issues. 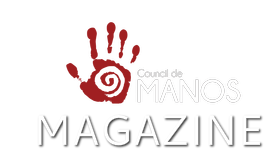 Manos Magazine is managing by the Council de Manos. The Council de Manos is a qualified 501(c)(3) nonprofit organization by the Internal Revenue Service. All donations are fully tax-deductible to the extent allowable by law. To continue the provision of those programs and resources serving Latinx Deaf, DeafBlind, Deaf Disabled, Hard of Hearing and Late Deafened (DDBDDHHLD) people, Council de Manos relies on the generosity of donors like you to ensure assistance is available to DDBDDHHLD Latinxs in need. Together we will make the difference. If you'd like to make a one-time donation to Manos Magazine, you can use PayPal to make it fast and easy. PayPal members can pay directly from their checking accounts or credit cards by "sending money" to mark.apodaca@councildemanos.org. Non-PayPal members can still pay with a credit card without signing up for PayPal. If you have questions or problems with your donation, please contact Mark Apodaca at mark.apodaca@councildemanos.org.